Ventilation systems for road tunnels are often inverter controlled and use Carbon Monoxide and Nitrogen Oxide detectors to ensure that the tunnel is well ventilated in all traffic conditions. In the event of a fire this same system needs to be able to act as the smoke extract system allowing the tunnel occupants to evacuate and emergency services to reach the source of the fire and tackle it. Each of the tunnel ventilation systems use either tunnel jet fans, large axial fans or a combination of the two to provide pollution control ventilation and smoke ventilation in the event of a tunnel fire. Longitudinal ventilation is used where possible, as it gives the lowest installation and operating cost. The most common method is to use Jetfoil fans where the relatively high velocity discharge induces a flow of air through the tunnel. As the jet from the fan diffuses, it transfers energy to the tunnel airflow and creates an increase in static pressure, which causes air to flow as in any conventional system. Large axial flow fans are used for transverse and semi transverse systems where the air is supplied or extracted through ducts from plant rooms. Normally several fans are used in parallel to provide steps in volume flow. Frequently the fans are VFD controlled to provide additional steps in ventilation, a lower operating cost at low levels of flow and low noise levels for night time operation. Often the fans are 100% reversible so that supply fans can also extract. To clear smoke from one side of a fire, reversible fans may be used with the duct system to create a longitudinal flow along the tunnel. There can also be occasions where a longitudinal system using Jetfoils is justified in addition to a transverse system as the operating cost at low ventilation rates is much lower. To avoid pollution at the openings of the tunnel, large fans may be used to capture the tunnel airflow and discharge it at a high level. 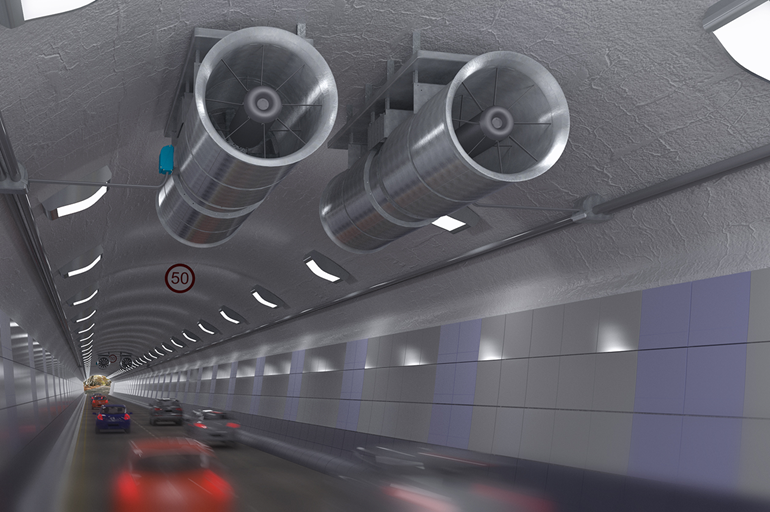 As electric vehicles and increasing levels of freight traffic (with potentially flammable loads) increase, particular attention needs to be paid to the long term fire ventilation requirement of the tunnel.